A team of nanotechnology researchers from the University of Pennsylvania and Columbia University has used friction force microscopy to determine the nanoscale frictional characteristics of four atomically-thin materials, discovering a universal characteristic for these very different materials. Friction across these thin sheets increases as the number of atomic layers decreases, all the way down to one layer of atoms. This friction increase was surprising as there previously was no theory to predict this behavior. The study, published in the current edition of the journal Science, was conducted collaboratively by Carpick and Qunyang Li of the Department of Mechanical Engineering in Penn’s School of Engineering and Applied Science; Hone, Changgu Lee and William Kalb of the Department of Mechanical Engineering in the Fu Foundation School of Engineering and Applied Science at Columbia; Xin-Zhou Liu of Leiden University in the Netherlands; and Helmuth Berger of Ecole Polytechnique Fédérale de Lausanne in Switzerland. 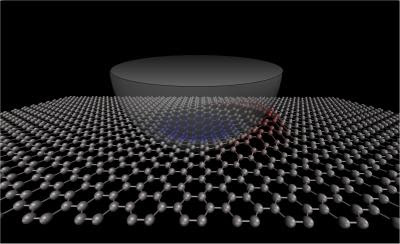 Research was funded by the National Science Foundation through Penn’s Laboratory for Research into the Structure of Matter, Columbia’s Nanoscale Science and Engineering Center, the NSF’s Directorate for Engineering, the Defense Advanced Research Projects Agency, the Air Force Office of Scientific Research and the New York State Office of Science, Technology and Academic Research.